The invitation comes from David Freshwater and his enthusiasm is contagious. 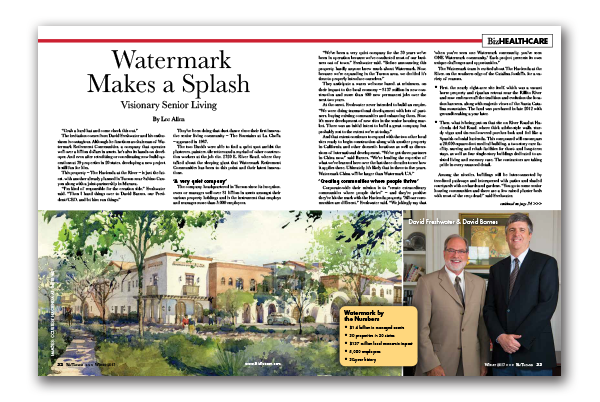 Although he functions as chairman of Watermark Retirement Communities, a company that operates well over a billion dollars in assets, he’s also its hands-on developer. And even after retrofitting or coordinating new build operations at 39 properties in 20 states, developing a new project is still fun for him. This property – The Hacienda at the River – is just the latest, with another already planned in Tucson near Sabino Canyon along with a joint-partnership in Marana. They’ve been doing that duet dance since their first innovative senior living community – The Fountains at La Cholla – appeared in 1987. The two Davids were able to find a quiet spot amidst the plasterers, painters, tile setters and a myriad of other construction workers at the job site, 2720 E. River Road, where they talked about the sleeping giant that Watermark Retirement Communities has been to this point and their latest innovations. The company, headquartered in Tucson since its inception, owns or manages well over $1 billion in assets amongst their various property holdings and is the instrument that employs and manages more than 5,000 employees. They anticipate a warm welcome based, at minimum, on their impact to the local economy – $137 million in new construction and more than 400 new permanent jobs over the next two years. The Watermark team is excited about The Hacienda at the River, on the southern edge of the Catalina foothills, for a variety of reasons. • First, the nearly eight-acre site itself, which was a vacant horse property and riparian retreat near the Rillito River and now embraces all the tradition and evolution the location has seen, along with majestic views of the Santa Catalina mountains. The land was purchased in late 2012 with groundbreaking a year later. • Then, what is being put on that site on River Road at Hacienda del Sol Road, where thick adobe-style walls, sturdy vigas and tin-roof-covered porches look and feel like a Spanish colonial hacienda. This compound will encompass a 20,000-square-foot medical building, a two-story care facility, nursing and rehab facilities for short- and long-term stays, as well as four single-story buildings dedicated to assisted living and memory care. The contractors are taking pride in every nuanced detail. Among the niceties, buildings will be interconnected by tree-lined pathways and interspersed with patios and shaded courtyards with orchards and gardens. “You go to some senior housing communities and there are a few raised planter beds with most of the crop dead,” said Freshwater. Not only will there be radishes and rutabagas, there will be large animals with soft brown eyes – equines that are known to be therapeutic. Under the direction of therapy pioneer Barbara Rector, residents’ physical and emotional well-being will be enhanced by on-site equines available for interaction through touching and grooming. Their efforts have been recognized, both nationally and locally. The American Seniors Housing Association this year ranked Watermark among the nation’s 16 leading senior housing and care providers while the Tucson Metro Chamber honored them with a Copper Cactus Nextrio Innovation Award. According to the company principals, once residents in senior facilities get beyond that hour or two of therapy or rehab services each day, there’s another 22 hours that isn’t programmed and amounts to warehousing. Barnes and Freshwater have been described as “passionate visionaries” whose minds don’t stop thinking about what can be done and how to do it. “A lot of our ideas are good in theory, but may be difficult to implement. It’s our challenge to figure out how,” one said. “Sometimes we have no idea how we’re going to pull things off and then, wham, the resources just show up,” the other added. Years later, he’s still bargaining from a position of strength, building on decades of real-world field experience and a daring-do to be different, to try new things, trying to figure out how to do things more efficiently to make Watermark properties a pinnacle of retirement living.